Not to be confused with Evangelical Lutheran Church in America. The Evangelical Lutheran Church (ELC) was a Lutheran denomination that existed from 1917, when it was founded as the Norwegian Lutheran Church of America (NLCA), until 1960, when it joined two other church bodies to form the American Lutheran Church. The Norwegian Lutheran Church of America was formed by merger of the Hauge Synod (est. 1876), the Norwegian Synod (est. 1853), and the United Norwegian Lutheran Church of America (est. 1890). The NLCA changed its name to The Evangelical Lutheran Church (ELC) in 1946. In 1960, the ELC joined with other Lutheran churches to form the American Lutheran Church. 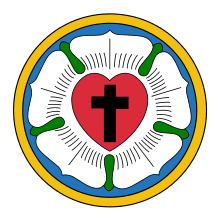 This coalescence of Lutheran churches continued into recent times, with the ALC joining others to form the Evangelical Lutheran Church in America (ELCA) in 1988. From 1917 to 1926 a general convention was held triennially. There was need of holding several extraordinary conventions, so beginning in 1928 (called the 8th) it was held biennially with the general convention always falling on the even numbered years. Voting members of the conventions were pastors who were currently serving congregations of the Church, and one lay representative from each parish consisting of one congregation and two representatives from each parish consisting of two or more congregations.